Navratri is festival which honours the victory of good over evil. Though the festival to a large extent is connected to Mother Goddess and her various incarnations, it also celebrates the victory of Rama over Ravana. To celebrate this event, one would come across the dramatic performance of Ramlila taking place across various parts of the country, especially in North India. 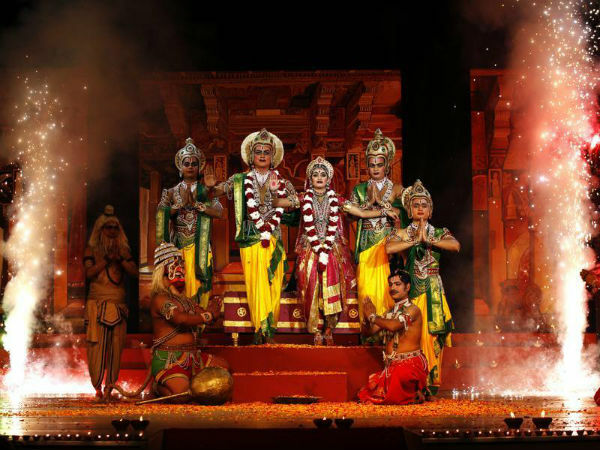 Ramlila is the re-enactment of the life of Rama according to the epic Ramayana. The performances begin on the first day of Navratri and come to an end on the 10th day, Vijayadashmi, where the effigies of Ravana, his son Meghnad and his brother Kumbhakarna are burnt down. People come in large numbers to watch these performances which are usually held either in temples or some grounds. The city of Delhi is one of the most popular places to witness the performances of Ramlila. There are quite a number of places across the city where a lot of people come to watch the performances by artists who come from rural as well as urban areas. Here is a list of four places across the city to witness the most extraordinary performances, make sure you attend them and don't miss them. The Ramlila Maidan is one of the most popular and oldest places in the city which has been used traditionally for the performance of Ramlila annually. It is said that the ground was earlier a large pond which was filled up with land by the Hindu soldiers of the Mughal army, to shift from the floodplains of Yamuna, where they originally performed the play. The place soon gained popularity and is now one of the most important places where the Ramlila is hosted. Located near the Red Fort market, the committee which performs here is known for elaborate performances which showcase the scenes of Hanuman, Ram and Ravana and do not include the others in a grand manner. This ground too is one of the most popular places which hosts the festival annually and gathers a lot of crowd. The massive lawns of the Red Fort are used by a particular committee who is renowned for its unique light settings and performances which are specially designed to grab the attention of the younger crowd. The lawns also are the spot where the annual Dussehra mela is held for all the nine days of the festival which showcases a large variety of stalls, games and events to keep the festive spirit alive. The well-known Shriram Bharatiya Kala Kendra is a theater space located near Mandi House. The Kala Kendra is a renowned cultural institute which performs a Kathak based Ramlila every year since 1957. The Ramlila here is enacted by professional artisans with a dash of contemporary choreography and art. The institute also runs a school for those who are interested in music, dance and performing arts in the city.